So, just how good is a £12,000 bicycle? How much of a difference does all that money make? 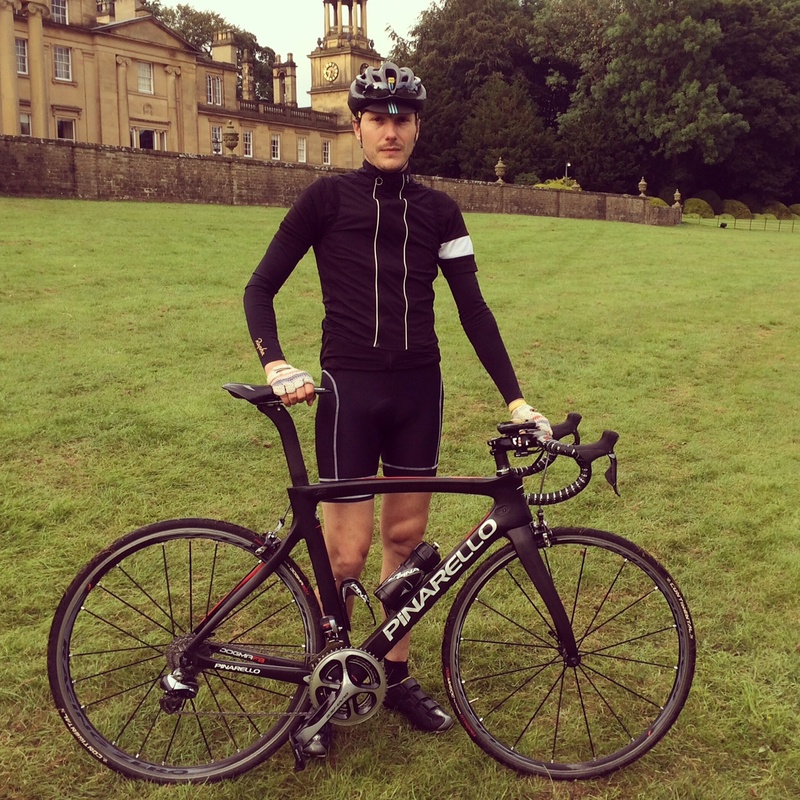 Last weekend I was given the opportunity to take the brand new Pinarello Dogma F8 – the very same as Team Sky are currently racing (and unfortunately crashing) across Northern France – out for a test ride in the Yorkshire Dales. Despite having a pretty full schedule planned for the day (there was the small matter of Stage 2 of the Tour going on) it was a no-brainer that I was going to find some time to fit this in. And so at 5.30am last Sunday, having risen scarcely later than locally resident rooks, I could be found – pedals in hand – at the Rapha Tempest Festival HQ on the front lawn of Broughton Hall to meet mechanic Ham and my superbike for the morning. Given that I have personally assembled my last four bikes from second-hand frames and groupsets, Ham is a little bit more used to riding high-end offerings than me so he was a good place to start asking question about what makes this year’s top-end Pinarello different from the last incarnation – the Dogma 6.5. Team Sky rider feedback about the new F8 has been nothing less than glowing and Ham was quick to confirm that the ride and feel is a step-change improvement on the previous model. Given that the 6.5 won the Tour, the World Championship and over 100 other races in 2013 that’s no small thing. In the current arms race of professional cycling hardware there is clearly no space for resting on your laurels. The first thing I notice is that the visually distinctive ‘wobbly’ forks and seat stays have been ditched for something quite a lot straighter. I’m glad as the old ones really irritated me to look at. The front forks still look a bit like they have been put on backwards but the new model is a lot easier on the eye as a result of the changes. The back end in particular is a whole lot more attractive than the previous version which always looked to me as if the seat stay was being excreted from the seat tube. The new seat stay junction owes a lot to the aggressive looking time-trial bikes of the moment (such as Pinarello’s Bolide) with the junction a good few inches below the top tube. It looks much, much better. Not that pure aesthetics probably had much to do with the decision to make these changes. 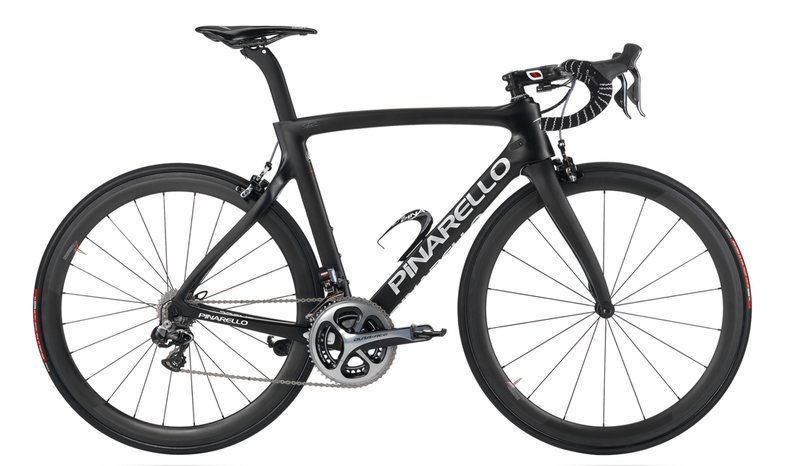 The F8 has been co-developed by Pinarello and Jaguar – another key partner for Team Sky – with the carmaker bringing their expertise in aerodynamics, computational fluid dynamics and wind testing to the team. Science clearly rules the roost here. 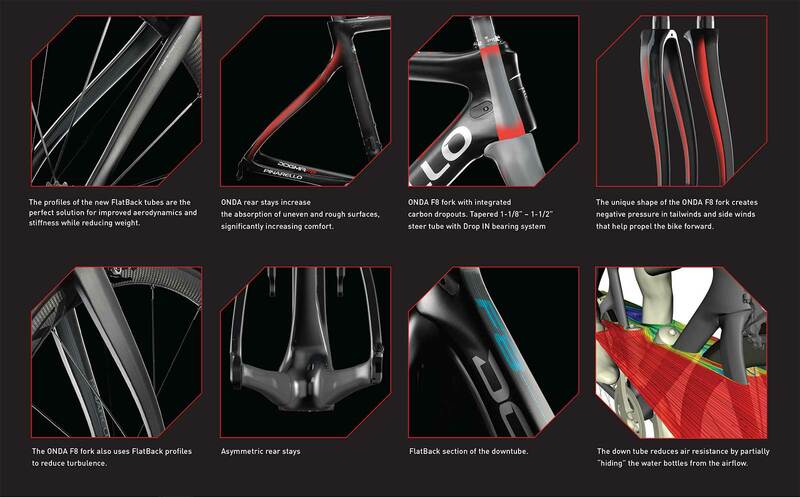 The F8 website makes for impressively dense technical reading: 120grams lighter than the Dogma 6.5, 47% more aerodynamic, 12% stiffer and even 16% more balanced – whatever that last one means. Load charts and CFD diagrams showing structural hotspots and smoothed wind flow crop up more often than the Froome vs Wiggins debate does on my Twitter timeline. The brochure (actually called a ‘White Paper’ on the website) runs to 31 pages of this kind of stuff whilst even the landing page ads are full of technical jargon and comparisons with aircraft – both commercial and military – abound. They clearly want everyone to know how much clever stuff is in this bike. As Ham helps me adjust the seat post and find a good position, I’m still rather more concerned with the basics. He reminds me that the brakes are set up the European way with the front brake on the left. Ah yes, good tip. I really don’t want to stack this particular bike. Having safely negotiated my way around the Festival tents occupying the front lawn and got out onto the estate roads, the first steep hill of the route comes immediately beyond one of the many gatehouses. With a night’s worth of camping stiffness still in my legs, it needs a full shift from the Shimano DuraAce Di2 groupset to find something that my cold calves can use. I’ve not ridden electronic gears before but found them to be simplicity itself once I had muscle-memorised the precise locations of the well sized buttons. Watching the self-trimming front derailleur do it’s own adjustments as I moved up or down the rear cassette was a hit with those riding alongside me but the ease of shifting and the continuous shifts when the button is held down was my joy alone. One long press quickly found a gear that fitted that first gradient and I got a pleasant taste of the lightness of the bike as I tackled the first of many climbs of the morning. The rest of the DuraAce groupset was also a joy to ride, with superb actuating on the super solid braking and comfortable hoods which have been designed to accommodate hydraulic braking if required. 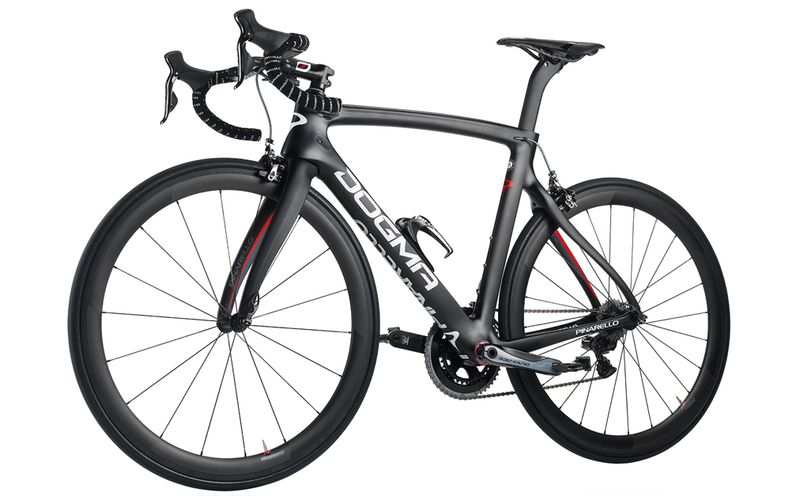 But of course DuraAce and Di2 has been around for a few years now and that is not what makes the F8 so special. To paraphrase someone else ‘It’s all about the frameset’. At just 860 grams for the size 54 (which due to Pinarello’s rather unique measuring system was the perfect size for a six-footer like me) it certainly is a featherweight. I actually hadn’t been too impressed when I first lifted up the bike to see how it felt in the hand but then Ham pointed out that there were two fully laden bidons on there already.. Take those off and it practically floats in the air. As we turned away from the Broughton Beck valley towards the open moorland high up behind the estate I got the first chance to let the Dogma put me through my paces. Both Ham and Chris Froome (in the F8 video on the website) had gushed about how well the bike transfers power through the frame and into the road better than anything else. They talk about the stiffness and asymmetry which allows this, rationalised the ‘Flatback’ tube technology and aircraft grade carbon-fibre. When I was asked by a co-rider how it felt for me I arrived at the same outcome in a slightly less technical way. “It’s like the bike isn’t there..” I kept enthusing to anyone who could keep up to listen. There was a famous saying in the Modernist Architecture era, coined by Ludwig Mies Van Der Rohe, that suggests that “Less is More.” This certainly applies to the F8. Great race bikes should be like good special effects or supportive underwear – the less you notice them the better they are. Having easily negotiated the Elslack Climb up the aptly named Moor Lane onto the blowy open tops of West Yorkshire’s high moorland, the next test for the F8 came on the descent to nearby Carleton in the next valley. Whilst I don’t mind climbing at all I am usually less than a picture of courage going downhill and can often be found quaking and shaking my way down a descent some way off the back of the group. I was therefore more surprised by the speeds I attained going downwards than the ones I had eased into going upwards. The smooth ride, responsive handling and subtle control gave me enormous confidence and I descended with something approaching a daredevil attitude.. For once no-one overtook me and I felt in control the whole time. This instant affinity with the bike gave me another boost and I tested myself further on the next climb back up to the moorland again towards the junction with the wonderfully titled Babyhouse Lane. Having accelerated once and left the others behind I found that I could go again and again with Froome-esque bursts that burned up the road but little else. Certainly not me. Every little bit of energy that I gave just threw the bike further up the road. Nothing seemed to be being wasted. It’s a hugely satisfying feeling. Having spent the long wait at the top watching stabbing sunlight pierce through the pitching clouds and listening to the haunting calls of a pair of circling curlews, our route then took us down another long rangy descent. Having really got the feel of the bike by now I enjoyed that run down towards Glusburn more than any other I can remember. Head down, on the drops, a finger hovering over the brakes but hardly using them. Even the threat of gravel patches and a couple of twisting curves at near the base didn’t phase me or the bike. With the climbing feeling so easy and the descending so fast I found myself wishing for a regular chainset instead of the compact so that I could really make the most of the empty roads and the great feeling of being connected with a bike. From Glusburn we struck out West, climbing again towards Lancashire and where the North-South Pennine Way walking path crossed our route. Talking with the others as we rose I heard various figures being bandied about. Ham had said £12k but others in the know said £15k for the TeamSky versions. At that level three extra thousand doesn’t seem to be too much to worry about but I suspect the difference comes mainly from the wheels, with Sky using full carbon as opposed to the aluminium Fulcrums I had for the day. I took the long climb a little less hurriedly this time allowing me to spend some time trying out different hand positions on the integrated stem and bars. Aero profiled and as full of bends as the old model forks when viewed from the top, they won’t be to everyone’s liking and I wasn’t overly convinced at first. The oval shape seems too much for me and took some getting used to. 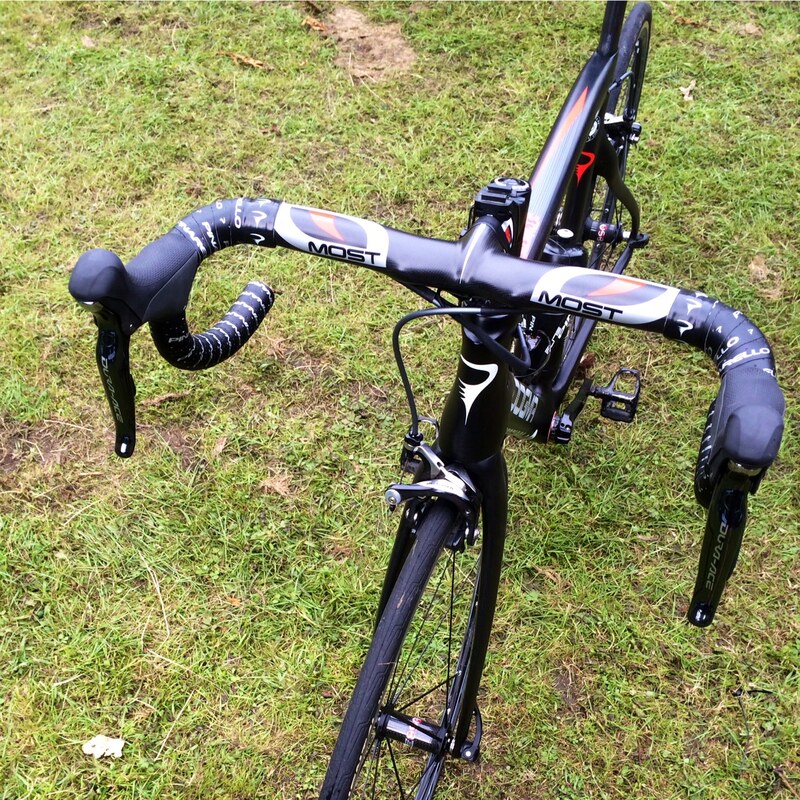 I ride on the tops and the hoods a lot – both of these were fine (if a little slippy on the tops as the bar tape stopped someway short of the stem). I also was surprised by how comfortable the bike was even way down on the drops with my knees hitting up into my chest. As we turned for home – I did briefly wonder about just riding on and on – I began to ponder the big question. It wasn’t about style, technology or even ride and feel. It was more a question of demographics. Just who is buying these things? Serious amateur racers? Show-off nouveau cyclists? Technology geeks? Clearly they have to be people with deep pockets and very secure bike parking. I’m excluded on both accounts and, despite everything that is fantastic about this bike, that in itself is quite a relief. The stress associated with keeping an eye on such an expensive piece of equipment could well outshine the pleasure derived from riding it. Perhaps if you can afford a Dogma F8 you can also afford a security guard to follow you and it around. Now, where is that lottery ticket? This entry was posted in Bikes, Product Reviews and tagged Cycling, Di2, dogma, DuraAce, f8, pinarello, rapha, shimano, tempest. Bookmark the permalink.